Daylilies have a weird, spidery root system with little bulbs attached. As the Dayliliy grows, the roots of two (or more) individual plants intertwine. Literally, you just pull the distrct plants apart. Voila! Two Daylilies! Daylilies reproduce quickly. They actually could be divided every year or so. The longer you want, the more entwined the roots become. Then….I bring out the spade shovel. I literally hack right the clump, and then start pulling. 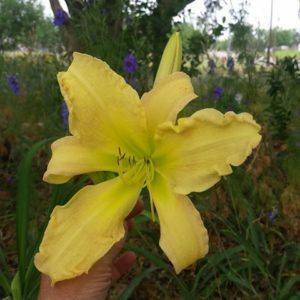 Daylilies are extremely tough. They stay alive after division without immediate transfer into their new home. If I can’t place them into soil, I keep them in plastic bags, with only the roots kept in the bag. All greenery out to breath fresh air. They can stay like that for a long time…..not forever though. Don’t push your luck! It’s a beautiful new day. The sun is out, and drying out the flood-soaked earth. 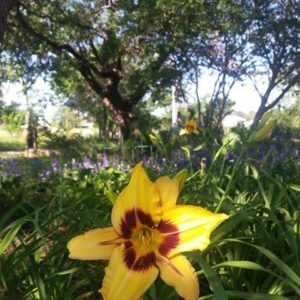 I will be placing more Heirloom Bulbs and Daylilies into their new home, and daydreaming of new paths to create through the garden. Digging Therapy is always good for the soul!